With Google Pay train booking support, a user can even cancel the ticket or check train status directly from the app. Google Pay, the UPI-based payments app, rolls out the feature of booking train tickets directly in India. By partnering Indian Railway Catering and Tourism Corporation (IRCTC), Google Pay(earlier known as Google Tez) enables its users to pay, search, book and cancel train tickets. This feature was already accessible by some users over the last few days but now it is available to all the Android and iOS users in the country. “We have already seen hugely encouraging user response for cab and bus ticket booking options on Google Pay with abhiBus, Goibibo, RedBus, Uber and Yatra. Now with IRCTC on Google Pay, your travel is made simpler even on trains. The IRCTC ticket booking support in Google Pay will allow the users to search, book, and cancel train tickets in the app itself. The app users will also be able to check seat availability, journey duration, and travel times in Google Pay. To access the ticket booking feature, the users will need an IRCTC account, but they will not be charged anything extra for booking tickets via Google Pay. The implementation seems to be similar to what the likes of Paytm and Cleartrip offer. 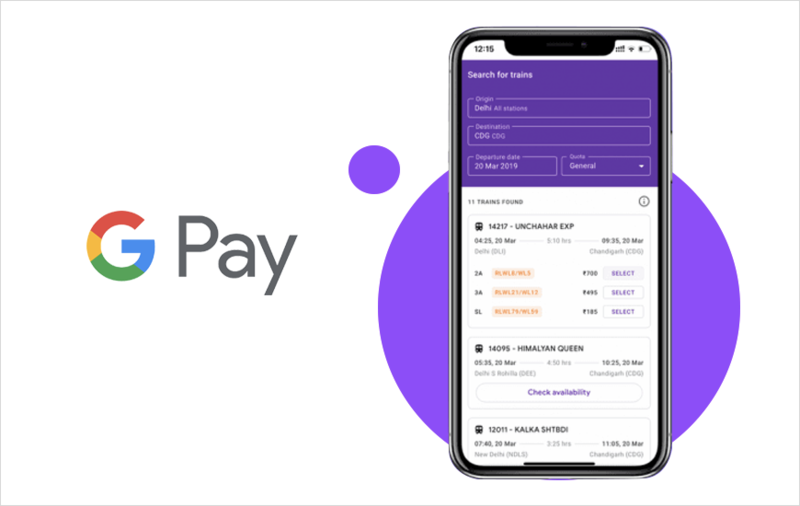 “The train ticket booking feature addresses an important need for Indian users, right within the app and is another step to making the lives of our users easier and more convenient with Google Pay”. The users will need an IRCTC account to access the ticket booking feature. There will be no additional charge for booking through Google Pay. Its implementation is quite similar to the likes of Paytm and Cleartrip. Step 1: Open Google Pay and then look out for Trains chat head in Businesses section. Step 3: Enter the origin, destination, departure date and quota to search for trains. Step 4: To check whether the seats are available or not, the user needs to tap on ‘check availability’. Step 5: After choosing your seat, tap on ‘select’. Step 6: Then the user will be asked to fill the login details of their IRCTC ID. Step 7: After filling all the details of the passenger like age, name, gender, tap on Continue. Step 8: Users will be asked to confirm booking information, the post which they will need to tap on Continue. Step 9: Choose the payment method and tap on Continue. Step 10: After entering UPI PIN, users will be redirected to IRCTC website again where they will need to submit their IRCTC password and the Captcha displayed. Step 11: In the end, click on submit to book a train ticket. Google Pay was originally launched in 2017. Google Pay is powered by Unified Payment Interface (UPI) in India while in other markets, it uses debit or credit card for payments. It offers a variety of features like bill payments, mobile recharges, peer-to-peer payments and much more.